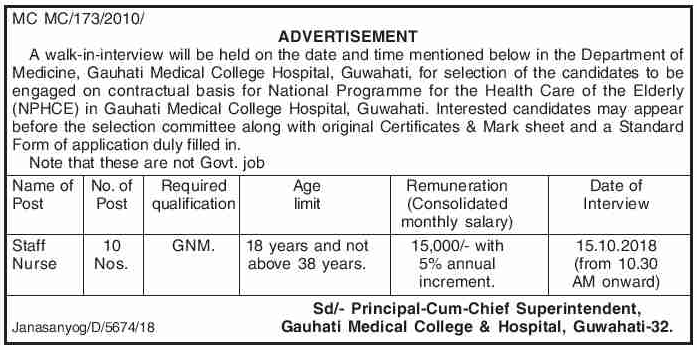 A walk-in-interview will be held on the date and time mentioned below in the Department of Medicine, Gauhati Medical College Hospital, Guwahati, for selection of the candidates to be engaged on contractual basis for National Programme for the Health Care of the Elderly (NPHCE) in Gauhati Medical College Hospital, Guwahati. Remuneration (Consolidated monthly salary) : 15,000/- with 5% annual increment. How to apply: Interested candidates may appear before the selection committee along with original Certificates & Mark sheet and a Standard Form of application duly filled in.